As we approach the end of 2017, we look with great anticipation to the next year- the first year of the cat. As you will see, we have a new blog and a new look. 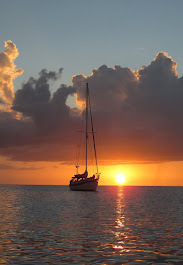 We have built a new blogsite to better feature our journeys aboard LEILANI. (Previous blog posts, including text and pictures, from https://svlayla.blogspot.com have all been imported and can viewed in the “Blog Archives”). We would be thrilled if you would follow us. Note to get a timely notice via email of all of our new posts, simply scroll down to the “Follow by email” gadget, enter your email address and click to submit. You will not receive other pesky messages, just a notice of a recent posting. 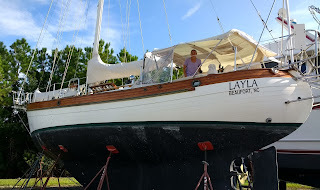 Also note we will no longer be posting on the S/V LAYLA blogsite. 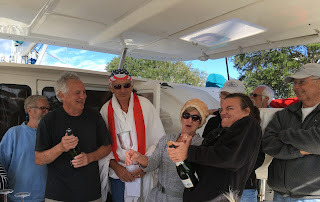 The boating community is legendary for its collection of characters, particularly, some of the most friendly and welcoming people you will meet anywhere on the planet. We present here a summary of the fun we shared with the Brunswick Landing Marina community in the traditional ceremony of re-naming a vessel. We are known to have scoffed about superstitions and related rituals employed to ward off evil spirits and/or to invite the good will of good spirits. We contemplated ignoring the superstition after deciding to re-name the boat but we thought better of it. 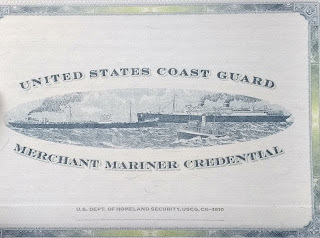 We reasoned that beginning with the first intrepid sailor who launched frail craft on uncharted waters there was at least one fearful loved one waiting onshore who attempted to bargain with the higher (and lower) powers to bring the sailor safely home. As sailing is perhaps older than 5,000 years, we figured there has been lot of bargaining going on. There has been a lot of “juju” and a lot of tradition. Sailors remain among the most superstitious of people and among the more important superstitions are those related to re-naming a boat. We decided we should not take boat renaming lightly, and that at the very least, a proper ceremony was necessary. We were not going to temp the fates by ignoring tradition and appealing to reason and rationale thinking. Besides, we knew this was going to be fun. As is often the case for anybody in need, the boating community came to our aid to guide us through the process. 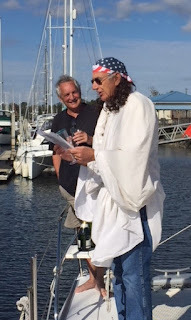 We learned another sailor, Peter, was schooled in, and most importantly, willing to perform the renaming ceremony. He informed us that we simply had to do a few chores first, then decide when to have the ceremony, and assemble any witnesses/participants. 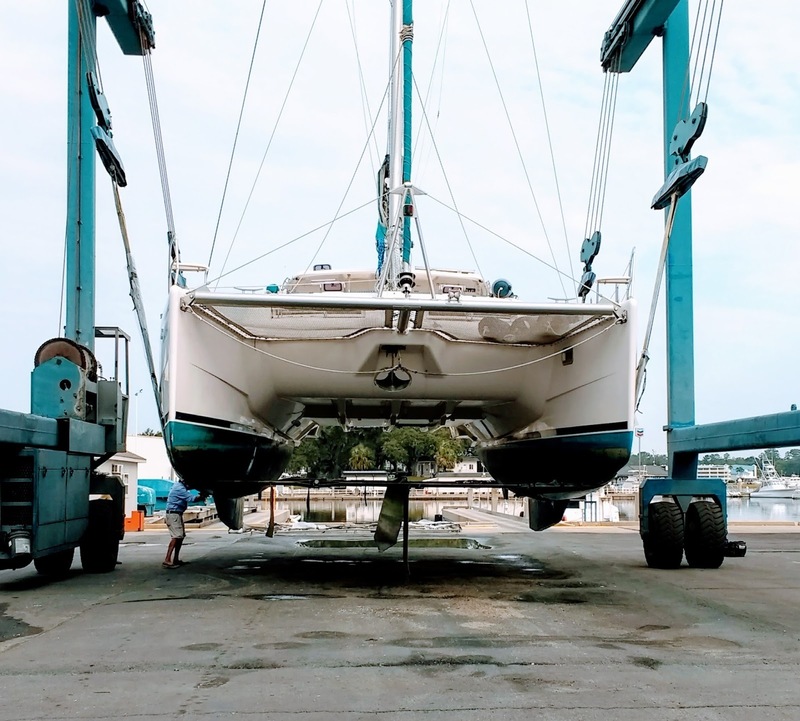 We removed remnants of the previous name from the two hulls and the stern, and from various onboard items such as portable gas and water cans, etc. As we had just applied the new lettering, we were directed to tape paper over the new name and hailing port. The new name would be revealed post-ceremony. 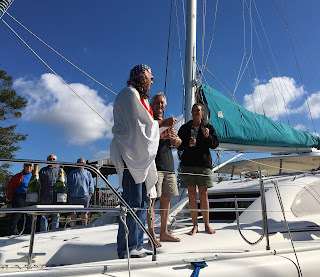 We also needed an “ingot of corrosive metal with the previous vessel name inscribed”, three bottles of champagne for offering to Neptune and the sea, and “sufficient” rum for the witnesses/participants. We finalized our shopping with a bouquet of flowers. By 2:00 a small group of witnesses had boarded the boat, and a larger group began to fill the floating docks. King Neptune arrived looking officious with his long hair and cape (although he had a remarkable similarity to our friend Peter who was oddly not present). 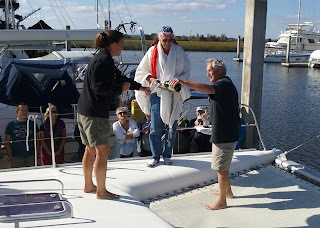 We joined Neptune first on the stern to open the bottles of champagne and then moved to the bow for the ceremony. A quick count of participants and witnesses totaled over 40! Fortunately, the majority of the crowd opted to stay on the dock rather than overload the boat and risk capsize. Popping the champagne for offering to Neptune. The ceremony began with Neptune appealing to the forces of nature and then champagne was offered and poured into the water to the north, south, east and west. It was a lovely ceremony! Drinking a sip of the champagne after appeasing the four winds. Amused and delighted by the generosity of our boat friends. Sailing Vessel Leilani is welcomed into the community. Everyone in the marina had so much fun that new requests for more ceremonies have been made to Neptune. A new ceremony is in the works to assist those vessels that had been remiss in having a proper re-naming ceremony. Apparently, that works too. Neptune will be busy over the next several weeks. 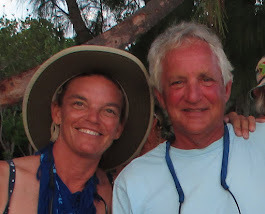 WHAT’S NEXT: We will be spending the week post-Thanksgiving with Bud’s folks onboard LEILANI! We are looking forward to hosting our first guests. We have plans for a new blog site to continue our adventures on Leilani. We will have more information and links in our next post. More to come! Best wishes and thanks to all for staying in touch. It is great to hear from you. Let us know what you think. Our new boat! 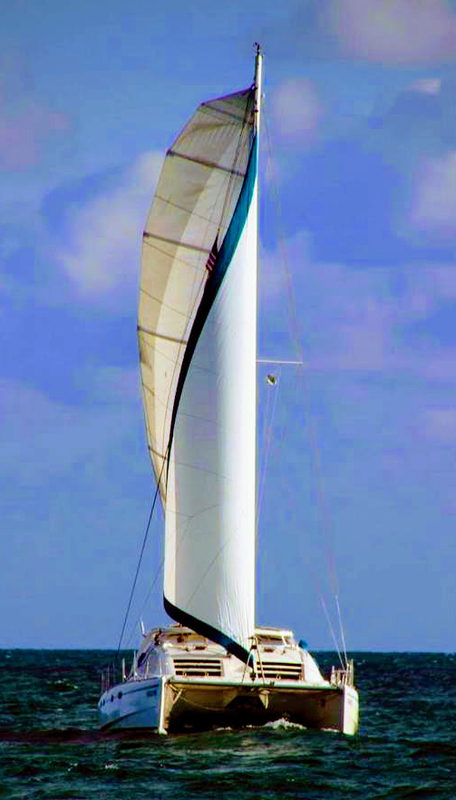 A 42' Leopard Catamaran. We have a few changes to report. Let’s start with the most recent and, perhaps, the most exciting news. WE HAVE A NEW BOAT! 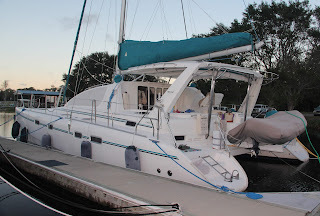 About a week ago we became the owners of a beautiful 42 foot Leopard Catamaran. As you may recall, after our travel to the Bahamas and back last year, we decided that catamarans had a number of features that we felt we would want for our next sailing expeditions. We did our research. We made lists of prospective models with all the key features and specifications. 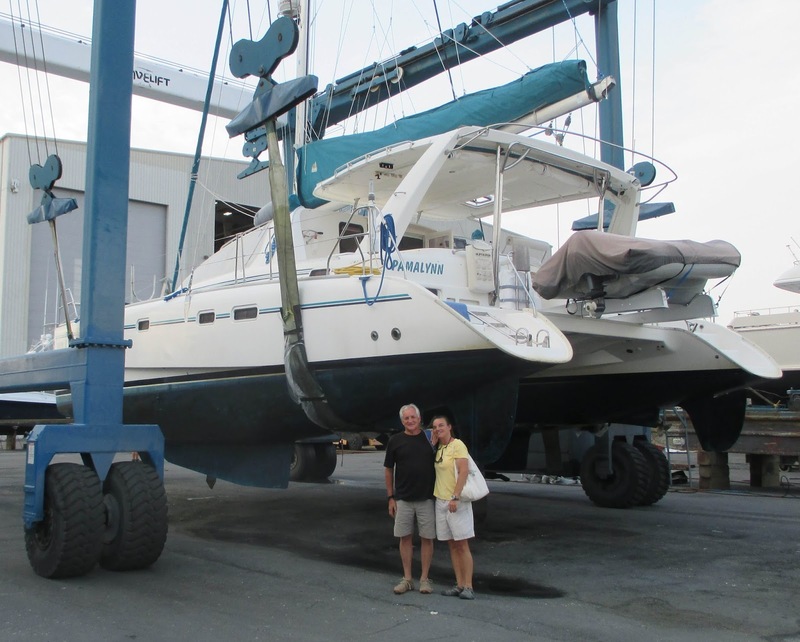 Our online search spanned the globe with promising boats in New Zealand, Guatemala, Martinique, British and US Virgin Islands, Wisconsin (fresh water boat), California, and beyond. The list of the most interesting boats eventually totaled over 75 including Leopard, Manta, Catana, Lagoon, and Privilege. More locally, we inspected boats in North Carolina, South Carolina, Georgia, and Florida. We had a pretty good idea of what we wanted, unfortunately, “the boat” at the right place and the right time remained elusive. 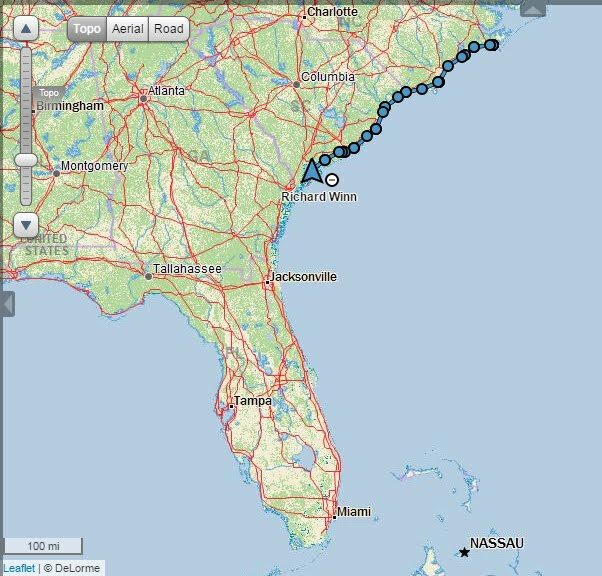 However, a call from a good friend changed all that and lead us to a recent listing of the boat in Brunswick, Georgia. In a future posting, we will give you a guided tour of Leilani and a summary of what led us to choosing her. The day of the survey at Thunderbolt Marina near Savannah, GA. Bud and Tracy excited and nervous about the survey. Leilani is now our boat. 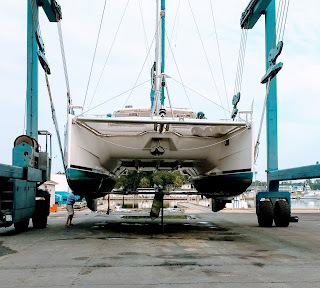 She is patiently waiting for us at Brunswick Landing Marina in Brunswick, GA.
As most sailors will tell you, “sailing is less about plans and more about intentions”. We had a wonderful week at the Brunswick Landing Marina getting acquainted to the new member of our family, and re-immersing ourselves in the warmth of the boating community. We intend to do a few boat projects over the next few weeks, including installing new lettering on the bow and stern for our new girl -“LEILANI”. 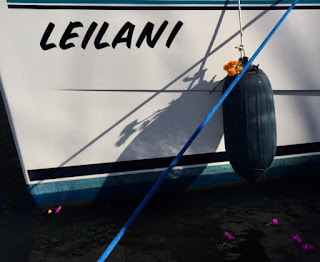 We chose “Leilani” as the name for several reasons: 1) We simply like to say “Leilani”, 2) “Leilani” is easy to say over the VHF radio (always important on a boat), 3) Leilani is Hawaiian for “Heavenly Flower” or “Royal Child”, and “Beautiful Girl” – ("Beautiful just like the Hawaiian flower, nobody forgets a Leilani”) , 4) We have had a special affection for Hawaii -we were married on Maui, and 5) We love our dear “Layla” but we wanted to have a different name for the new boat. For us, “Leilani” closely embodies many of the same sentiments as Layla. Following these next few weeks we expect to describe a bit more detail of some of our intentions for a shake-down cruise and more extensive sailing. You may recall that we needed diversion from sitting around while Bud recuperated from his rotator cuff surgery, so we went back to school to prepare for the Captain’s License examinations. 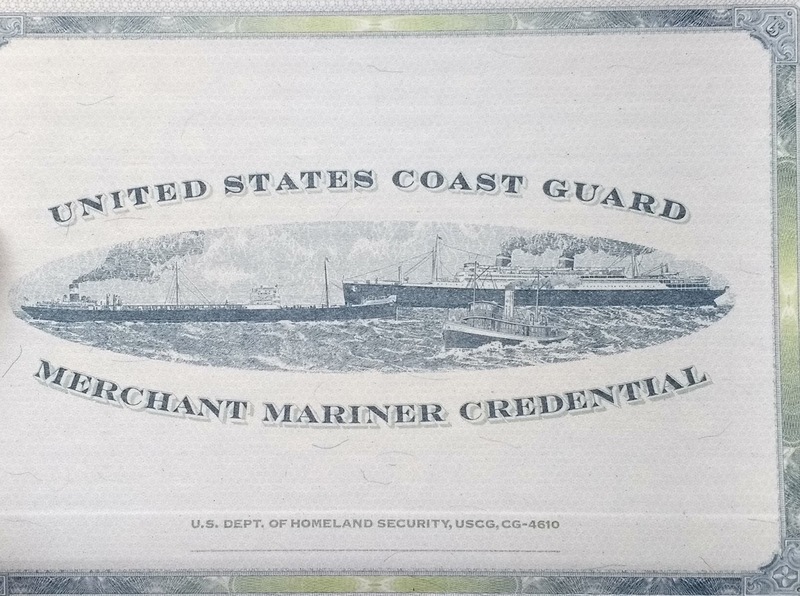 We passed the exams in April, but we had several more hurdles to jump over before the Coast Guard would grant us the “Operator of Uninspected Vessel” Certificates. 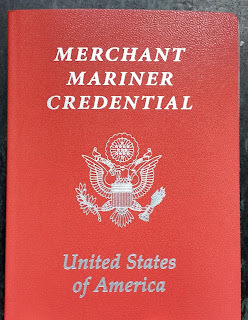 Among those requirements included, medical exams, drug tests, transportation workers identification cards, sea time documentation, and fees and more fees. Finally, the certificates were awarded this month. We are officially Captains. Was it all worth it? Hey, well, it did reduce the rates on the boat insurance, but aside from the pride of completing a grueling process and the reinforcing of important information along with, let’s just say, trivial information, um, we have to wait on the answer to that. It's official. 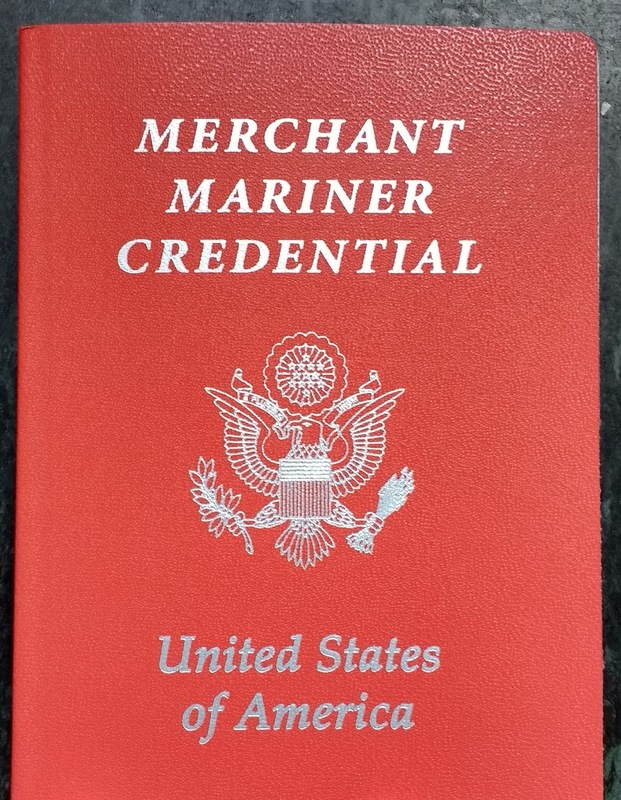 After a six month process, we have our Captains licenses in hand! What about Layla? We have had a few inquiries and showings. Spread the news, she is a great boat and ready to go anywhere. Layla is ready to go. Tracy not included! Check back soon. We expect to have some more updates.